I have some sad news. I will close Albion Europe in 2015. I will of course make sure that all outstanding orders/pre-orders made are delivered first! So for all of you with pre-orders - don't worry! I won't close until I have delivered your swords. 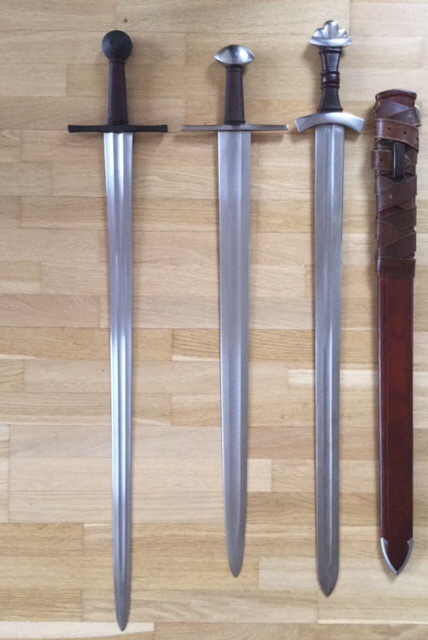 I will still take orders for made-to-order swords (swords not in stock) during January ...but the last day for ordering an Albion that isn't in stock at Albion Europe will be January 31st. After that I will only sell the swords I have in stock. If you are looking to buy an Albion in February or later you can order from - and have it delivered by - Albion US (you know where to find them :-)). I am sure there will be a new European reseller soon where you can get your swords. I expect to have delivered all orders by September 1st and will close down the shop/web shop at the end of September at the latest. It has been a privilege selling Albion swords for 9 years now ... but the time has come for me to move on to something else. Thank you very much to all my customers and friends in the sword community! I only have good things to say about Søren, i'm sure others do to . This is truly heartbreaking news. Especially since I am saving money to buy a Talhoffer. I ordered a Ringeck from you in 2010, as a wedding gift to a friend of mine. It was the highlight of the party and everybody wanted to have their picture taken while holding the sword. The next day my local HEMA group grew by five new members. Great memories. Thank you for everything and I wish you all the best in your future endeavors. That is sad news. No offense to Albion USA but Albion Europe is by far the better website and your photos are exceptional. They certainly helped me take the plunge to buy my first Albion without ever having handled one. Best of luck in your next adventure and please keep us updated. I'll miss having such a good sword dealer in a neighbouring country. I too am sorry to see Soren leaving. He is a lovely man, has run Albion Europe superbly and his energy and excitement will be missed. Good luck in whatever 'non-sword related activity" you get up to next. I do not live in Europe but have followed the ASE facebook page, and even submitted a few photos. I am really sorry to hear this for my European friends because I know how painful it can be with some countries customs laws. I echo the comments about the web site. Even though I have no reason to purchase through Albion Europe I found the information and pictures very useful, not to mention beautiful. Don't know who owns such stuff but it would be great to preserve this for the Albion home page. They have all their photos on flickr. Sad news - good luck my friend. It has been a priviledge to work with you. Having just moved to Sweden (from the US via Canada), and having never ordered a sword from Albion Europe till now, I really hate to see them close up shop - so much easier to deal with an EU based company in the EU than all the export / import red tape ordering from Albion USA - so when I saw they were going to close I just had to order some items I had been researching, and drooling over, for a while. One was the Reeve, and the other the Oakshott ... never having bought a premium sample from the likes of Albion (just two replicas from Valiant and Cold Steel), I was a bit hesitant, specially since the EU price is significantly higher than in the US. But I just received the two and they are gorgeous, I mean they just float in the air, making my old Hedemark (from VA) feel a bit like a quarter horse ... this all makes me wish I had bit the bullet to order from them earlier when they had more variety left in stock (which they surely want to clear out asap). So anybody have any ideas who will take over distribution for Albion in Europe??? Really sorry to hear that - it was always a pleasure dealing with you. Best wishes for the future though and thanks. Albion Europe will soon be closed but its legacy will live on.